If you’re one of the half of American small businesses that doesn’t yet have a website, this guide is for you. 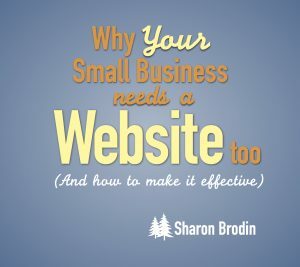 Or if your business has a website, but you know it’s not working hard enough for you, this guide will help you understand how to make it better. We live in a digital world these days. A dedicated, professional and dynamic website at the center of your marketing strategy is essential. WHY ONLINE? Because that’s where 80% of your potential customers are looking for you. WHY DEDICATED? You need to own your online real estate, not let others set the rules for you. This guide will explain why your social media profiles, review sites and others don’t do the job. WHY PROFESSIONAL? Because your competitors are, and because your customers expect it. This guide outlines what makes your website look and act professional, including proven usability best practices. WHY DYNAMIC? I mean two things by dynamic. First, a website that’s mobile-friendly — it adjusts in order to fit the smaller screens of mobile phones and tablets. Second, the content is continually updated, and new content is regularly added. This guide will explain why that’s necessary. Just zip me an email, mention this PDF guide and I’ll get it to you, no cost!